I got a request for this a while ago (when I posted up pictures of Inquisitor Lok) and I figured what better to use than the door pieces from a Space Hulk commission I have to show how I paint up old, weathered metal. With the GW washes, it's real easy to get some nice effects in no time at all. Here's the process I use, step by step. 1. I primed the piece black. If I were working on a portion of a model, I might go in and just basecoat that particular area black. 2. Basecoat it silver. I use the cheap stuff myself but I would say to make sure you uses a nice, bright silver. Again, it's personal preference, I suspect that if you started with a darker silver or metal color, the overall finished piece would be much darker. 3. Wash with Badab Black. Just cover it with this stuff. I go heavy on this pass. Make sure to get the whole thing. With a piece like this, I had to make sure I got the sides covered. With Inquisitor Lok's shoulderpad, I needed to make sure I got the edges and where the shoulderpad met up with his robes. You don't want any areas left unwashed. 4. Wash with Devlan Mud. Another heavy pass like the black. 5. 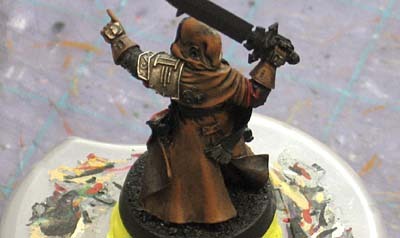 Drybrush or line highlight (depends on what you're painting) some highlights with your original silver color. What this does is simulate the wear and tear from actual use. Think about the areas that would get handled or grabbed or walked on the most and highlight those. These are the areas that will almost always be "cleaner" since they see so much wear. 6. One more wash with Badab Black. This time, I dilute it with water 50:50. This is just to blend the highlight with the rest of the area. Optional: You can go in with Gryphonne Sepia or Devlan Mud wash again in key areas for a grimy effect. If you're painting a base, you can use other colors like Baal Red or Thraka Green to simulate blood and other chemicals that may have spilled. Using washes for this part (blood and spills and such) will keep these effects subtle. If you're looking for something a little more obvious, you'll need to use a technique that's a little more obvious. Excellent tutorial and very useful indeed. I always have problems with this sort of thing. Try the same exercise but instead of gw washes make your own glaze with extremely watered down Hawk turquioze once dry do the same with beastal brown. Awright - thanks for the tutorial! I was trying to figure out how you did it, but I didn't think that GW's washes had anything to do with it. Those washes really make painting easier, don't they? It would be cool to see how to work rust into it. Darren: Washes are great. The trick is learning when NOT to use them though. They do so much but it's knowing when to go with something else that matters. In this case, they happen to be perfect. Alexander: I'll see what I can do about getting some other tricks posted. Until then, I'll add some links to the bottom of this post. Very nice how-to. Easy and clear.